I am going to use Caring Bridge to update for now. I hope to be back to a normal blogger at some point. At the boys' 9 month check-up, Colin's iron tested low. Dr. Kim put him on a supplement for a month then we re-tested. It was still low. On August 9th, he had a CBC (complete blood count) test. It still showed his iron was low, but no other problems. Last Tuesday evening, Andrea was here helping me. I picked Colin up to play and he felt a little warm. Sure enough, he had a pretty high fever for him. It stayed over 100 to 101 the next few days. Sometimes Tylenol and Advil would bring it down, but not all the way down. At the same time, at some point, I noticed he had a cold sore. I thought maybe he was just fighting a virus. Boy did I think wrong. On Wednesday night, Allen's mom was here and all of a sudden we noticed some sores on his body. I took him to the pediatrican Thursday morning and we were sent straight to the ER. Yikes. I am not sure the reason she sent us was the problem, but I sure am grateful for Tania at Dr. Kim's office. She told me "I don't like his color and these sores need antibiotics but I won't give them to him without some further testing." 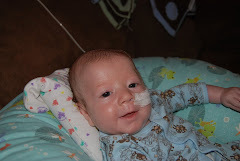 Long story short, Colin's blood is low and his immune system was so low that he couldn't fight even a cold sore. So teething-Colin spread the virus to his little fingers and to his nose since he won't keep his fingers out of his mouth. It is a scary thing to be told everything that could be wrong. I won't go into details yet because we truthfully don't know all of the answers. So far, I can tell you that leukemia has been MOSTLY ruled out. We are waiting on test results to confirm. The doctor today explained "there could be hundreds of things wrong and we are eliminating them...sometimes one at a time." It could possibly takes weeks or even months to figure out what is going on. It has been a long weekend and we are just getting started. Please pray for his bone marrow and blood counts to be healed and normal. We love you all and thank you for your prayers. 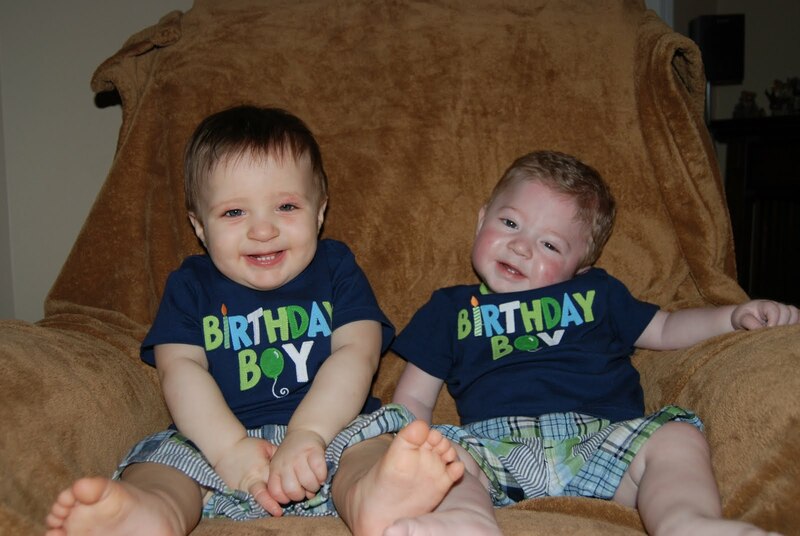 Colin and Ethan turn 1 today. Wow. WOW! 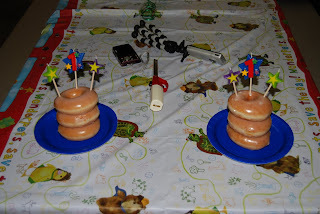 We had a party and invited lots of family and a few close friends. It was hard making the list...I wanted to invite EVERYONE! About 74 people showed up which was about half. Not a bad turnout for a hot Saturday afternoon! 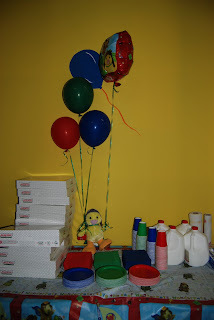 We had it at Jumpits - a very kid-friendly place with a party room. 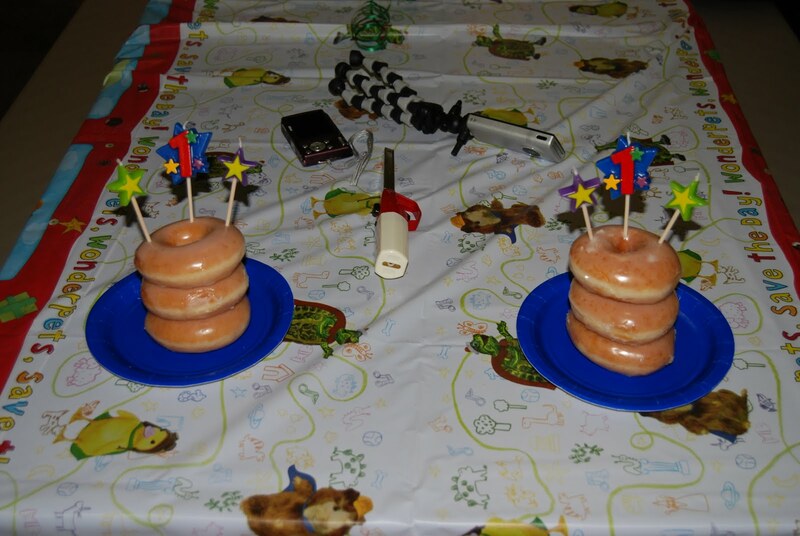 I did Krispy Kreme donuts instead of traditional cake. I just never found a cake I was happy with that I could afford to feed that many people! HA! Ethan has a world to his left! Ethan is smiling even while wearing the annoying neck brace. He only has to wear it for a week. Dr. Williams performed a muscle release surgery on Ethan last Wednesday June 16th. Allen and I both had a lot of "what if" questions about this - could we have done his exercises more often or positioned him better to help with this problem. Dr. Williams told us after surgery that therapy NEVER would have released what he removed. We were relieved and just have to move forward with getting him better! In less than a week, we can already tell that Ethan's neck is improving! He starts rehab and physical therapy on Thursday, so please pray for effective exercises that will help him gain full range of motion with his neck...and for overall strength for his muscles in his body. He really seems to be doing great but we still want more for him! During the same surgery, another doctor took out his g-tube and put in a low profile button. It doesn't change anything...he is still being tube-fed. It does make it a whole lot easier to remove WHEN he is eating by mouth. We are going to The Marcus Center on June 30th for a feeding program evaluation. We've heard it is like boot camp for "stubborn" or problem eaters. They have a whole team of doctors that work together to see if Ethan is eligible for treatment. The third procedure was a scope of his vocal cords. Dr. Gower DID find a deformity in his vocal cords that seems to prevent them from closing. We thought up until now it was his low tone that was doing that. So...what does this mean? We have no idea! I'm gathering information and asking questions. She did mention a very tedious surgery that might or might not help - and we have A LOT more questions about that. Please continue to pray for Ethan...for overall strength, for the desire and ability to eat by mouth and for developmental milestones to be natural for him to accomplish. We are seeing definite improvements and progress and that is so encouraging. It will still be months, possibly years, before Ethan is doing things that Colin is already doing. For THAT, I ask for prayers for his self-consciousness and self-confidence. We know he can do it (at least until someone tells us otherwise)!! I am also asking for prayers for wisdom for Allen and me. We still have a long road ahead of us with Ethan's healthcare. He has 10 (at last count) doctors and 3 to 4 therapists. 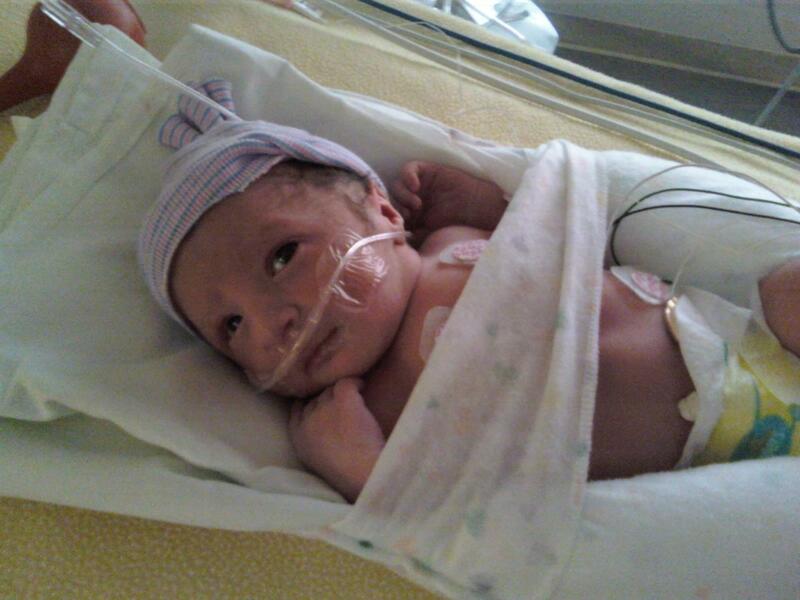 Allen and I have a committment to make sure we give Ethan every possible chance at living a "normal" life as we can. We want God's guidance on how to make that happen! Colin is simply amazing. 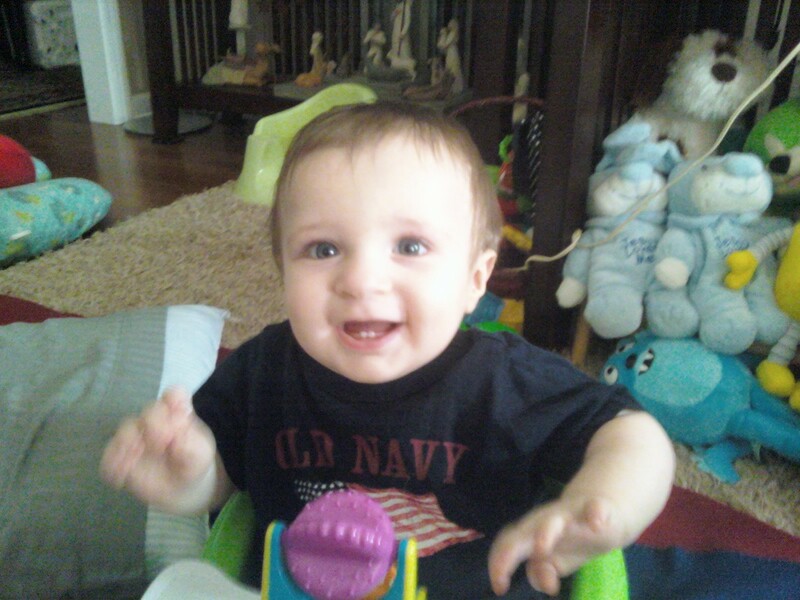 All of a sudden (with some restless days and nights), he has 8 teeth! I think it is 8...he clamps his mouth shut if we try to look. He also clamps down on fingers so no way am I putting my finger in to feel exactly how many, but I think all 8 have finally poked through. He learns new things very quickly...you can watch him watching something new and can just see his wheels turning. He has also just figured out a few things on his own. When I am "high 5-ing" with him, sometimes I close my hand. He pries my fingers open so he can keep hitting my palm. He loves ANYTHING that spins...a lot of the toys have moving parts, but the wheels and gadgets that spin are definitely his favorite. HOW DOES HE KNOW TO DO THESE THINGS?! He is so much fun to watch! He isn't crawling but wow can he move around! Crawling is the very next thing, I'm sure. We haven't encouraged it because I know once he figures it out, we will spend most of our day trying to keep him corralled! I am pretty sure in the next few weeks, we are going to put the dining room furniture in storage and turn that area into the boys' play room. I'm thinking the rubber mat squares on the floor and all of their toys will make a fun place! Plus gates of course! And then there is sweet, brave, strong (in the character-sense) Ethan! Within the last week and a half, he has transitioned to wearing his helmet 23 hours a day (and is doing VERY well in it). He is so cute...Allen's mom says with his face framed by the helmet, he looks more like Allen than ever. Personally, Allen and I think he also looks a lot like her...which is very sweet to see, since he is named after her! My mom calls him "Super Ethan!" He is having surgery on June 16th to have his neck muscle that is still so tight "released." The doctor actually cuts some of the tight muscle out to allow it to stretch. Ugh...but the he is VERY confident that we will see good results quickly. THAT is good news! 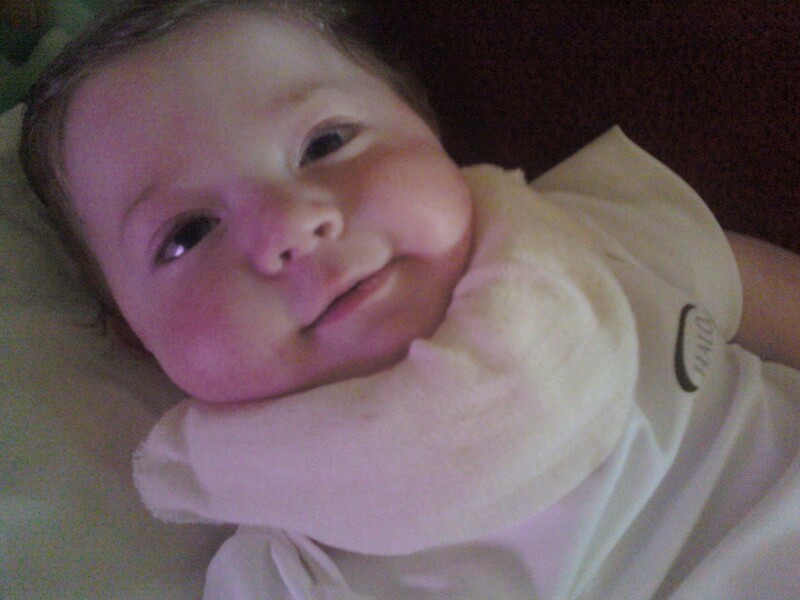 I have been very careful using the words "special needs" when talking about Ethan. Everything we know about Ethan's "condition" (which isn't much and we still don't have a diagnosis, more on that later) tells us that he should grow out of a lot of this, if not all. Well, what I mean is that as he gets stronger, strength will help him compensate for his low tone. 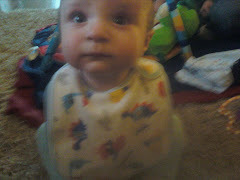 His physical therapist says she has seen low tone babies sit up, crawl, walk...just delayed, which we already knew. His doctors tell us, without making promises, that things SHOULD improve as he gets bigger and stronger. All of that to say...we did buy him a special needs chair. I gulped as I ordered it...but it is called a Tomato Seat and is specifically designed to help babies with low tone build core strength. Ethan LOVES to sit up, so we can't wait to learn how to position him in it so he will be able to sit up more during the day. Right now, he lies down to eat (Dad...is that proper grammar?) with his head turned to the right. Unfortunately, that positioning does not help his neck at all. I really try not to do a lot of "what ifs" in life. I don't think it is constructive and it certainly doesn't show a lot of faith in God...and I think He can make all decisions "work." I do think that we could've helped Ethan a lot more with positioning...and maybe we wouldn't have to have surgery. There are a lot of ways to think about it...but I am trusting that we are walking down the right road for right now. We want what is best for Ethan...always...and we don't enter into any decision lightly. Whew...so...we have put off another surgery that another doctor wanted to do on June 16th. 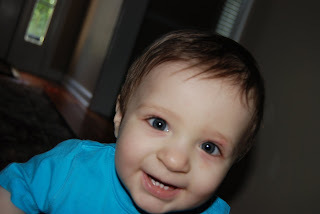 Every doctor we've ever seen with Ethan has mentioned a muscle biopsy. We now are working with Dr. John Shoffner. He is the director of Medical Neurogenetics, which is a lab that does LOTS of specialty testing. 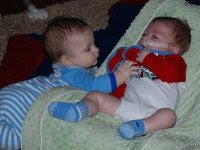 He wants to do a muscle biopsy and a spinal tap on Ethan to see if he can diagnose him. At this time, we are staying active as a patient but have declined surgery for now. Ethan is progressing, so Allen and I aren't in a hurry for a diagnosis. As I type that, I do have to say that this testing IS in Ethan's future. There could be medicine or treatment that would help him, so we don't want to miss out on that. But for now, we are fine with putting off the pain of additional surgeries. Both boys are very happy. The both clap their hands in response to "yay Colin or yay Ethan!" They both love to smile and laugh. Colin and I look at each other sometimes and just start laughing for no reason. You can see his whole body shake. Ethan's laugh is so different, but it is a wonderful sound. Their smiles and laughter are my VERY favorite part of being a mommy!! I read a fundraiser letter today for Cobb Pregnancy Services. The person ended her letter with "In His Grip and By His Grace." I liked that so I'm using it today to blog about the latest with Ethan. Things are happening fast! First of all, good news, he weighs 16 pounds 12 ounces (or so). 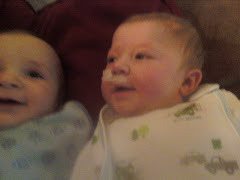 We are on a rigid feeding schedule every 3 hours, but it is working so I'm commited to it for now. I even got us up at 4 this morning so we don't have to skip a feeding today because of a doctor appointment. Yawn...but EVERYONE tells us the more Ethan weighs, the stronger he will get. Come on 17 pounds!! That was the goal for him by 9 months, and that deadline is fast approaching us on Friday! We did see Dr. Williams last week. 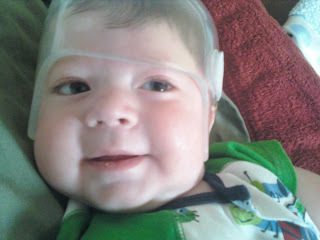 He is putting Ethan in a STARband helmet. You can see some amazing, sweet pictures at http://www.starbandkids.com/. Some of the before and after pictures in the documentation makes me realize just how much this will help Ethan. His head shape is so OFF because of him laying on his side so much to eat. 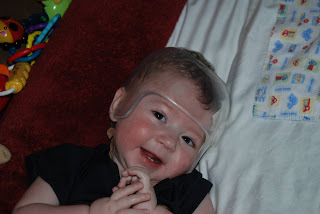 And that fights with his torticollis because he now has a flat spot and that is where his head automatically falls unless he is "on" and is holding it a different way. Unless we position him just right, he sleeps on that flat spot...which just makes the head shape, neck muscles and possibility of surgery worse. We DO have surgery scheduled for the middle of June. However, his therapist is really excited about getting him in his "motorcycle helmet" and seeing what we can accomplish between now and then. The doctor is fine with cancelling surgery if it isn't needed. He would prefer that, too! In His Grip and By His Grace...we can do this! We did get the boys' hair cut on Saturday. Jerry Potts from Bass Hair Salon made a house call and trimmed their hair. They both did really well. Colin had less patience and really just wanted to know what Jerry was doing. When we held his head still, he got "sad Colin face" so we only trimmed around his ears. We owe a huge thanks to Jerry for helping us out! No news = good news! There really hasn't been much new to report...and I am thankful! Colin is growing, growing...and is really wanting to crawl. He gets on his hands and knees and rocks...then does a belly flop and "swims." Allen and I can't wait to get him in the pool and let him splish-splash! He surprised us both this weekend by yelling out his first word. Mama! Allen and I are both shocked...everyone said they would say "da da" first and they've both said "ma ma" first! I am working with them both so they will hurry up and add "da da" to their words!! Ethan is, well, Ethan. He has a head FULL of hair. We are trying to figure out someone that can come here and give them both a trim (nothing drastic, just really to shape it up so they don't look scraggly). He jabbers and has the sweet, soft voice. When he says "ma ma" it is hard to get anything else done but just talk back to him...and smile lots! He is still very unpredictable with the throwing up, but he is ssslllooowwwlllyyy gaining weight. It seems like he was stuck at 15 pounds 12 ounces for days. 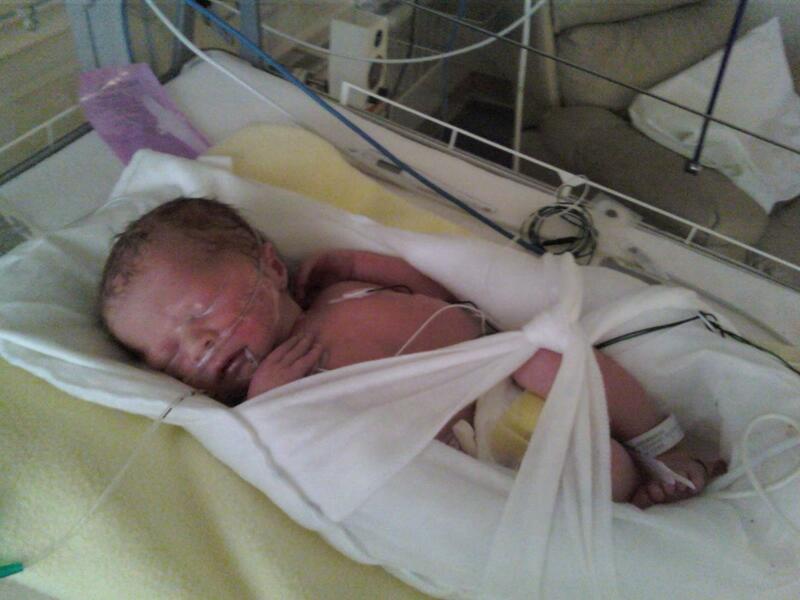 Now the number is 16 pounds 3 ounces. We are taking him to the cranial-facial doctor Thursday. He should look at Ethan's head shape and his torticollis and make some recommendations on treatment. 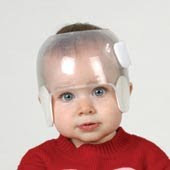 His physical therapist feels sure they are going to recommend a helmet. All I can think is "what else can this child take?" I am so thankful that God's grace is sufficient. I don't know how much more this mommy can take! He has made some GREAT strides with his torticollis in the past few weeks, so I am really hoping to avoid any extreme treatment (like surgery or a brace) for that. So things are probably just pretty "normal" for us right now. And that is a good thing!